The inquest into Princess Diana's death will be a "vigorous and searching inquiry", coroner Lord Justice Scott Baker has said on its opening day. Various theories surrounding the deaths of the princess and Dodi Al Fayed would be explored, including that she was pregnant when she died, he said. London's High Court heard that Dodi's father, Mohamed Al Fayed, remained convinced his son was murdered. The inquest comes 10 years after the couple died in a car crash in Paris. A jury of six women and five men were selected by ballot from a shortlist of 25 at the start of the hearing, which could last six months. Speaking at the start, Lord Justice Baker said some people believed something "sinister" had been behind the crash in the Pont de l'Alma tunnel on 31 August 1997. He told jurors: "We shall be conducting a vigorous and searching inquiry through the evidence so that the true cause of death may, if possible, be determined once and for all." The jury was shown a picture of the princess in a leopard-print swimsuit taken in the summer of 1997 - sometimes cited as evidence that she was pregnant with Dodi's child. But Lord Justice Baker pointed out that the photograph had been taken shortly before Princess Diana met Dodi. He also said Mohamed Al Fayed believed the couple were murdered by British secret agents acting on the direct orders of the Royal Family and the then-British government. 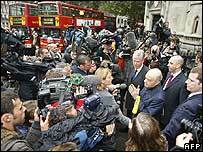 Speaking outside the court before the hearing began, Harrods owner Mr Fayed told reporters: "At last we're going to have a jury from ordinary people and I hope to reach the decision, which I believe, that my son and Princess Diana have been murdered by the Royal Family." The inquest hearing began on the day the European Court of Human Rights dismissed a complaint brought by Mr Al Fayed against the French authorities over their investigation into the crash. He had accused them of not fully following up relevant leads. But judges ruled any refusals Mr Al Fayed had met with "did not, as such, call into question the effectiveness of the investigations as a whole". In the second week of the hearing, the jury will be flown to Paris to retrace Diana's final journey.